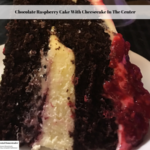 Rich chocolate cake with a baked cheesecake center drizzled with fresh raspberries is the perfect dessert for any special occasion. For this recipe I used Mrs. Fields Fill-N-Flip pan, from Love Cooking Company. I did receive this pan for free for review purposes and I love it! Use spray butter to grease the pan. Add the sugar and vanilla, mixing the mixture is lump-free. Add the egg and mix until all the ingredients are well incorporated. Pour the mixture into the pan and bake for 20 to 25 minutes. 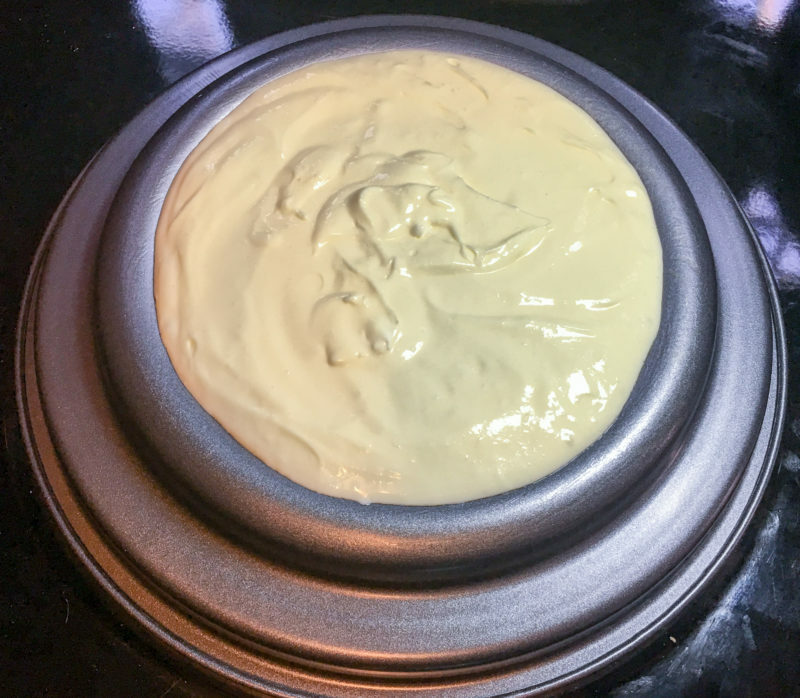 When the cheesecake is ready, the edges will be golden and the middle only slightly wiggly – not runny. To remove from the pan, run a knife around the edge to loosen it. Place a plate on the top of the cheesecake and flip it so the plate is on the bottom. Once the cheesecake is loose, cover it with Saran Wrap and place in the refrigerator. 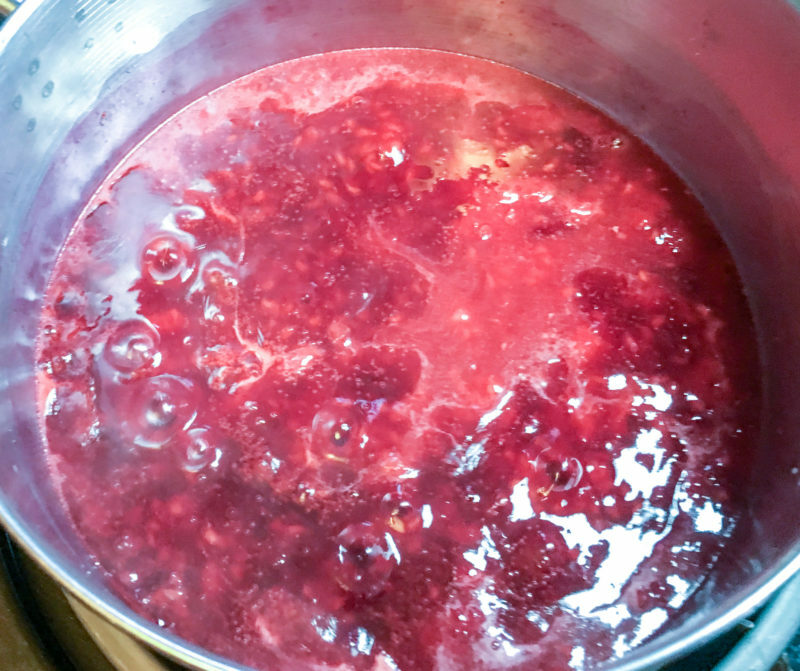 Place half the raspberries and all of the raspberry sauce ingredients in a stainless steel saucepan. Once the mixture begins to boil, turn down the heat to medium-low and cook for an additional five minutes making sure to stir the mixture occasionally. Press the mixture through a sift to remove the seeds (optional). Reserve the sauce and discard the seeds. Cover the sauce with Saran Wrap and refrigerate. Spray butter on the pan to grease it if you did not already do this. Flour the pan then turn it upside down to discard the excess flour. Sift the flour, cocoa, baking powder, baking soda, and salt together in a separate bowl to make sure they are well-blended. Add the oil, eggs, milk, and vanilla to a mixer bowl and blend. Add half of the dry ingredients to the mixer bowl and blend. Add the hot coffee to the mixture and blend again. Add the remaining dry ingredients and continue blending until the mixture is lump-free. Pour the batter into the cake pans making sure to leave space in the pan for the batter to rise. It is ok if there is some leftover cake batter – you can use it to make cupcakes if you wish. Remove the cake from the oven, set it on a cooling rack and allow it to cool completely before trying to remove it from the pan. Place the cream cheese and butter in a mixing bowl and beat it until it is smooth. Add the powdered sugar and then the vanilla extract to the bowl and beat it again until all the ingredients are well combined and the mixture is free of lumps. Place the cheesecake in the middle of the chocolate cake. With the Mrs. Fields Flip And Bake Pan, you will see the indentation where the cheesecake goes. Place some of the reserved raspberries on top of the cheesecake, then top them off with the raspberry sauce. Feel free to add a few fresh mint leaves to the top for garnish if you wish. Place the top half of the chocolate cake on top of the raspberries. Drizzle the remaining raspberry sauce on top of the cake and top with a few more fresh raspberries. Serve immediately or cover with Saran Wrap and refrigerate until you are ready to serve it. Baking Tip: Set all the ingredients out an hour ahead of time so they come to room temperature. Use a spray butter to grease the pan instead of grease. Fresh mint leaves make a great garnish for this cake.